In my final round of highlights from the 2016 Outdoor Retailer Summer Market, I’ll share some of the new and upcoming outdoor apparel and footwear. There’s some notable items sure to appeal to both casual hikers as well as thru-hikers. You may be wondering, “How can a shirt or pair of boots get any better?” Believe me, they can. Outdoor manufactures are constantly striving to make hiking apparel more comfortable, more breathable and lighter weight. Many brands are even making products more durable so that they will last longer and create less waste from wearing out too quickly. Here are some of my top picks. After this peek, you may just start filling out your holiday wish list early. The Gauge Tee with Polartec Delta fabric is designed for warm, strenuous activities. Underneath the rain gear and puffy jackets, your basic hiking apparel is still pants (or shorts) and a shirt. There’s been lots of technology put into shirt materials and designs to maximize performance and comfort—and it’s about to get better. Outdoor Research’s Gauge Tee employs the new Polartec Delta textured fabric which combines hydrophobic and hydrophilic fibers. 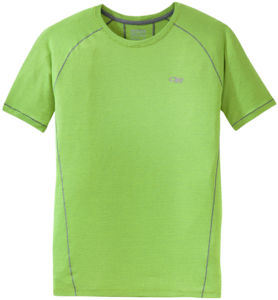 Designed for warm-weather aerobic activity, this uber-lightweight and breathable tee is designed to keep you cool and dry while trail running, mountain biking and grinding up and down those big mountain passes. As soon as the PCT: Oregon crew can get their hands on some of these, we’re going to put them to the test. Some thru-hikers believe you have to sacrifice comfort for light weight to take on a long-distance hike. I say, “No way.” Now you can have both. Mountain Hardwear’s AC Henley is about the softest, most comfortable performance shirt I have ever felt. Constructed of a woven (not knit) Wick-Q fabric, it is exceptionally soft to the touch. And how’s 2 ounces for light weight?! Pair that with Mountain Hardwear’s AP Scrambler Pant and you’re good to go. I’ve found that hiking in climbing pants is much more comfortable than regular hiking pants for their stretch and durability, and these sharp new pants look to improve on that. It doesn’t matter what season you’re hiking in Oregon, on the PCT or any other trail, Mother Nature can throw curveballs sometimes. That’s why you go out prepared with your Ten Essentials—and why you make sure your essentials can hold up to a variety of weather and temperature conditions. Touted as the jacket that “belongs in every thru-hiker’s pack,” the Mountain Hardwear Thundershadow Jacket looks more than capable to take on any adverse conditions you—or Mother Nature—throw at it. Constructed of ripstop VaporDry fabric, this packable, breathable shell looks ready to take on the PCT in Oregon, and beyond! 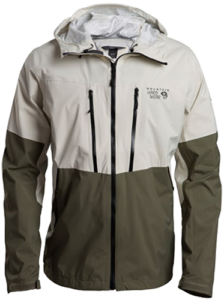 For a few years now, Outdoor Research’s Ferrosi Jacket has been a hikers’ favorite for its breathability. Next came their Helium Rain Shell, which became another favorite for its resistance to weather. (My Helium Jacket has laughed off some serious downpours!) This year, incorporating the best from both worlds is the new Outdoor Research Helium Hybrid Jacket. Up top, this new jacket is all Helium, with the same weather- and water-resistance to keep you dry on the outside. Underneath, its all Ferrosi by utilizing the same ultra-breathable fabric to keep you dry on the inside. That is one slick innovation. The Scapegoat is a lightweight, breathable boot for rugged terrain on any trail. Your apparel is what keeps you warm and protected from the elements, but it’s your boots that get you down the trail. 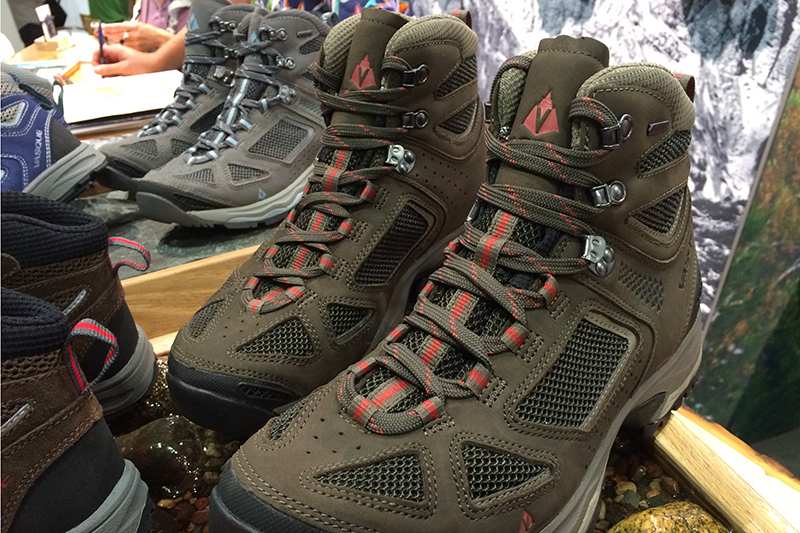 There were plenty of new and improved trail shoes and boots on display at Outdoor Retailer this year, including updated models from Lowa and Vasque (two of my faves). 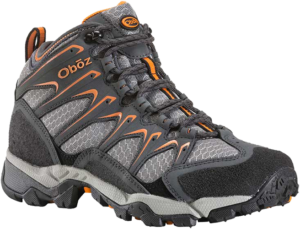 One set of treads that caught my attention was Oboz’ Scapegoat Mid Hiker. This lightweight boot employs a mesh upper for the ultimate in breathability. It also features an ankle scree collar to keep trail debris out, an abrasion-resistant toe guard and a beefy Thru-Hiker outsole to tackle every trail surface the PCT can throw at you. I’ll be giving these a run with a review coming soon. Support your favorite trail with Point 6’s PCT Crew. For those that like full protection from their footwear, while still being light and nimble, La Sportiva is rolling out three new models. Each feature their unique Gore-Tex Surround with durable leather uppers. The series starts with the Genesis Low GTX trail shoe, followed by the Catalyst Mid GTX light hiker, and topped off with the Nucleo High GTX trekker. All three models are surprisingly lightweight for such sturdy trail shoes. 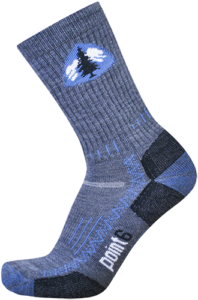 Of course, you need socks between your boots and your feet, and what better socks to wear while hiking the PCT than Point 6’s PCT Crew? Constructed of a nylon–wool blend, these socks are designed to keep your feet cool, dry and comfy down those long PCT miles. Plus, proceeds from the sales of these socks supports the PCTA—bonus! In the coming months, PCT: Oregon’s gear testers will be giving many of these items a run for their money on the PCT and trails around the Northwest. Follow PCT: Oregon on Twitter, Facebook and Instagram for the latest news and updates.